Click here to view a picture gallery of our property! 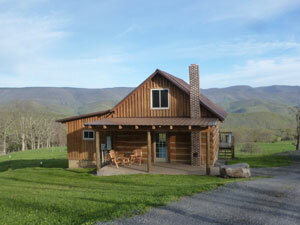 WV Log Cabin 1 is a traditional log cabin, 900 sq. ft., Cathedral ceilings with exposed beams and hardwood floors. Large living area. Up the spiral stairs in the open loft is 2 queen beds. There is also a sleeper sofa downstairs. The Gas log stove with open front and sides is surrounded by beautiful natural field stone. Satellite TV with DVD/Blueray/CD player, Radio. AT&T and GSM Tracfones work inside and and outside of Cabin. 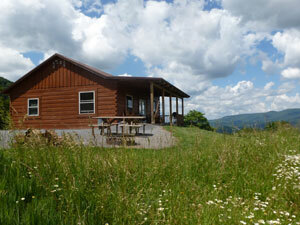 This is the largest of our cabins at 1400 sq. ft. Cathedral ceilings with exposed beams, hardwood floors. Large living area. There is a bedroom downstairs with a queen bed and a rollaway bed. Up the log steps in the open loft you will find 2 queen beds and 2 twin beds. This cabin has 1 main floor, 954 sq. ft. with rough cut pine vaulted ceilings. Large living area. 2 bedrooms with 1 queen bed and a set of bunk beds in each room. This cabin is best for handicap but not fully handicap accessable. Handicap shower head available upon request in advance. This cabin is 2 story, 968sqft, with all wood walls and ceiling. 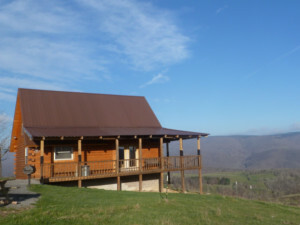 The view from the 2nd story covered deck of the Lookout gives you the awe factor. 1st floor has a full bath and 2 bedrooms. One with a queen bed and One with a queen and a bunk bed. The upstairs is all one room, living room, kitchen, dinning with windows on 3 sides and a covered deck on 3 sides. 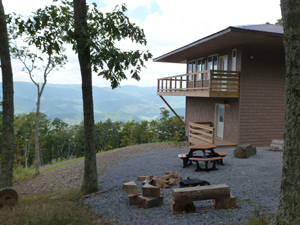 When building this cabin we wanted to build a cottage so it resembled a fire tower. More pictures and prices coming soon. Call for prices. AT&T and Tracfone cell service works at every cabin but there are no landline telephones at this time.